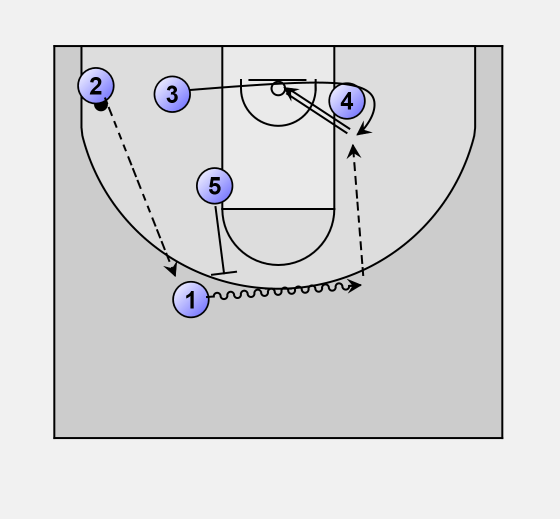 On break, Player 4 moves to weak side low post. Player 3 cuts in and then hard outside. Player 1 moves back. Inbounds pass goes from Player 5 to Player 3 to Player 1. Player 2 sets a down screen for Player 5. Player 5 comes off the screen and looks for the pass from Player 1. If the pass does not come Player 5 clears the key and sets up on the strong side high post. If the pass does not to Player 5, play continues with Player 3 screening for Player 2. Player 2 moves outside to take the pass from Player 1. If Player 2 does not have the shot he will reverse the ball back to Player 1. Player 3 will cut through the key off Player 4's screen as Player 1 dribbles to his side. If the defense is in tight MTM Player 5 should pop out to screen for Player 1. Player 3 will look for the pass & shot from Player 1.